The Michael J. Fox Foundation is dedicated to accelerating improved therapies and a cure for Parkinson's disease. 88 cents of every dollar spent goes to research. Developing new treatments for a complex brain disease such as Parkinson’s takes a long time. As anyone affected by Parkinson’s disease (PD) will tell you, it takes too long. The Michael J. Fox Foundation (MJFF) works to speed up the process in order to transform patients’ lives. Your support is critical to achieve this goal. An estimated 6 million people worldwide live with Parkinson’s today. PD is the second most common brain disease after Alzheimer’s and currently there is no known cure. The Michael J. Fox Foundation is dedicated to accelerating a cure for Parkinson's disease and improved therapies for those living with the condition today. MJFF also helps address the lack of clinical trial volunteers, which often stalls trial progress. 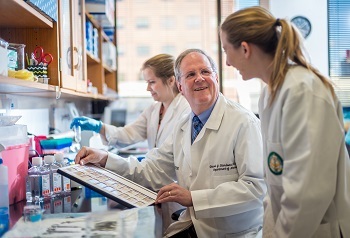 The Foundation pursues its goals through an aggressively funded, highly targeted research program coupled with active global engagement of scientists, Parkinson's patients, business leaders, clinical trial participants, donors and volunteers. MJFF identifies the most promising Parkinson’s research ideas, evaluates field-wide risks and challenges, and works through roadblocks to usher better treatments from the laboratory to pharmacy shelves. Each individual experiences Parkinson’s differently: The disease can affect movement, voice and facial expression, among other symptoms. MJFF is determined to do whatever it takes to advance better treatments to help those with PD live well and, ultimately, to stop the disease in its tracks. The Michael J. Fox Foundation holds no endowment. Instead, MJFF deploys funding to the field quickly and efficiently — usually within three months or less. Since inception, the Foundation’s singular goal has been to cure Parkinson’s and close our doors. In addition to funding more than $800 million in research to date, the Foundation has fundamentally altered the trajectory of progress toward a cure. Several Foundation-driven projects to potentially slow or stop the progression of Parkinson’s disease are in clinical (human) trials, and more are expected to begin testing in the next two years. The Foundation also has mobilized tens of thousands of people with and without PD to take part in clinical trials, helping fill a critical gap in the drug development process. Patients are the center of every decision — and so is a commitment to efficiency: 88 cents of every dollar we spend goes directly to high-impact programs to speed a cure for Parkinson’s. Look us up on Charity Navigator to see exactly how our dollars are allocated. Visit charitynavigator.org and search for EIN 13-4141945. Five million people worldwide live with Parkinson's Disease, the second most common brain disease. Our in-house team of scientists and project managers works tirelessly to advance Parkinson's research.